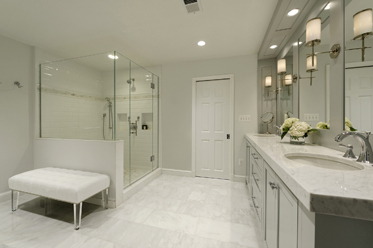 McLean, Va. – BOWA (www.bowa.com), an award-winning residential design and construction firm specializing in luxury additions and renovations received high honors from the National Association of Remodeling Industry (NARI) Metro DC chapter as the winner of two 2015 Contractor of the Year awards. The awards were accepted by BOWA’s Doug Horgan, Vice President of Best Practices on March 5, 2016. BOWA won CotY’s Grand Award in the category of “Entire House over $1,000,000” for a project in Chevy Chase, MD. In the wake of a devastating home fire, BOWA restored and renovated the home from top to bottom. The original floorplan worked well for the family, so the focus of the project was on incorporating design elements and fine finishes that better suited their evolving needs and lifestyle. Additionally, BOWA received a Merit Award in the category of “Entire House $250,000 to $500,000” for a whole house renovation project in Bethesda, MD. Every area of this classic colonial was touched with a focus on improving the first floor flow, remodeling the kitchen and family room and creating a beautiful spa-like master bath. In addition, BOWA was recently voted the Best Remodeling Firm for 2016 by Bethesda Magazine’s readers. BOWA is consistently a top vote-getter each year in the magazine’s best builder category and also won the Best Remodeling Firm title the last time it was offered in 2012. With a focus on delivering remarkable client experiences, BOWA specializes in luxury renovations ranging from master suites and kitchens to whole-house and whole-condo remodels. For over 28 years, BOWA’s design build experts have been guiding clients through every step of the remodeling experience from the first thoughts of the project, throughout architecture and construction, and continuing through a lifetime of ownership. And, consistently, 95% of clients rate BOWA a 9 or a 10 when asked if they would recommend the company. BOWA’s commitment to customer service and industry-leading budget guarantee, schedule guarantee and warranty are among their reasons. With offices in McLean and Middleburg, Virginia, BOWA has won more than 185 awards for excellence and serves clients in Suburban Maryland, the District of Columbia, Northern Virginia and Virginia’s Hunt Country. For more information, visit www.bowa.com or call 703-734-9050.